Early Fraktur Drawing [H1020] - $12.00 : Yarn Tree, Your wholesale source for cross stitch supplies. 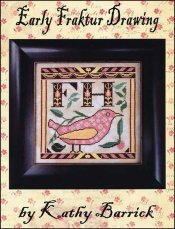 Cross stitch pattern by Kathy Barrick. This beautiful pink & yellow bird is enjoying a nice spring day! A nice, cool breeze is in the air, with leaves falling all around. Look closely at the body of the bird & you will see small white motifs. You can personalize this design by stitching your initials. Enjoying stitching this design as the birds sing you a song! Stitch count 125 wide x 123 high.